Spike Lee goes for the jugular of the alt-right movement and President Trump in this hilarious and vital Palme d’Or contender. A comic thriller about a black police officer going undercover to infiltrate the KKK, it’s amazingly based on a true story – despite what looks to be a satirical scenario. Lee directs BlacKkKlansman as if he’s making the pilot for a new cop show hinged on the classic cliché: the mismatched partners. The film’s broad tone is somewhat unexpected for such an extraordinary tale of police infiltration in the post-counter culture world of 1970s America. Lee, however, never once loses track of the larger themes and horrific social history. 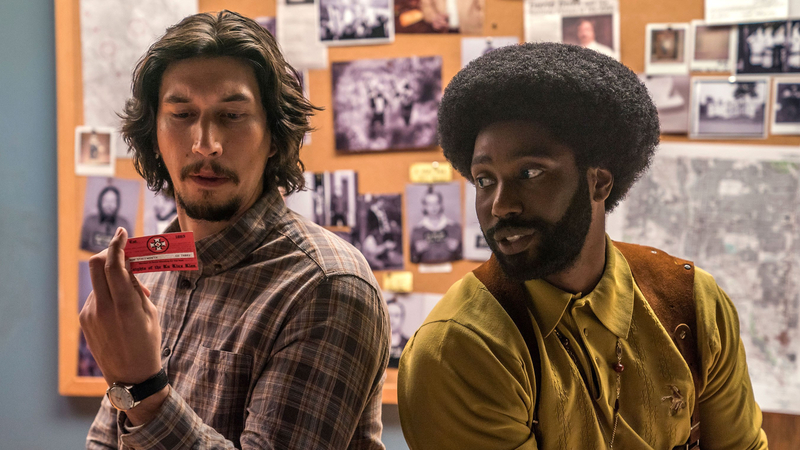 Like Lethal Weapon, but with the roles reversed, Ron Stallworth (John David Washington) is the crazy cop and the white partner, Flip (Adam Driver), the cautious and sensible one. The tone is almost cartoonish at times, helped in part by the portrayal of the white supremacists as buffoons without a brain cell between them. Their redneck idiocy provides plenty of chortles and Lee’s tactic – to relentlessly take the piss out of the KKK – is definitely a winner. Seeing an advert in a paper one day, Colorado Springs’ sole black policeman telephones the local chapter of the KKK and inquires about joining. Because he’s African-American, whenever he has to meet the guys in person, he sends in Flip. As the pair go deeper and deeper into the vile and pathetic world of the KKK, they find themselves questioning their identities as Americans – what the country is supposed to represent and be versus the horrid reality. Flip is Jewish but easily passes for just your ordinary white slice. But when he’s confronted with KKK suspicions regarding his heritage, he too starts to ponder questions he hadn’t ever really considered. Because in white America, Lee tells us, you will be reminded of your non-European background and made to feel like an outsider in what is your country of birth. For Ron, it’s par for the course, but for Flip, his awakening comes as a great surprise and he very much becomes an ally and true friend. President Obama’s election was supposed to herald a hopeful new age of post-racial politics in America, and although Lee’s film is set in the 1970s, it’s very much about recent events in Midwest and southern states – the numerous incidences of white cops murdering black kids, the #BlackLivesMatter movement, the Charlottesville marches, Dylan Roof’s crimes, the rise of douchebags like Richard Spencer and preppy bros with Tiki torches and sporting polo shirts waxing racist about how ‘white’ America is under threat from African-Americans and Mexicans and the international Jewish conspiracy, a bizarre and fraudulent claim, where racists get to play the victims of an oppression which exists entirely in their paranoid minds. That Lee has crafted a funny film full of snazzy editing, stylish imagery and a tremendous blues rock score, yet is laser-focused on a very serious subject matter, demonstrates his mastery of the cinematic medium. Subtle he isn’t, but then again, he never has been. BlacKkKlansman, like Chi-Raq, is defiant in its message of love and tolerance in the face of blind hatred.